How to achieve easier, faster and better customer control with a combination of data from sources with information from the customer? How to make use of the opportunities inherent in modern, integrable tools for KYC / AML when the core systems move too slowly? What kind of KYC / AML operations or which sources do you consult separately from your main tool that should have been integrated into your system? We also invited Bjørn Urtegaard from Thommessen law firm, to discuss KYC in a large customer perspective. A survey from Thomson Reuters (2017) showed that 85% of customers had a negative KYC experience, where 12% chose to change bank as a result of the negative experience. This shows the importance of finding better solutions than those we have available today. Cluster members from all over Norway brainstorming KYC needs. Photo: NCE Finance Innovation. 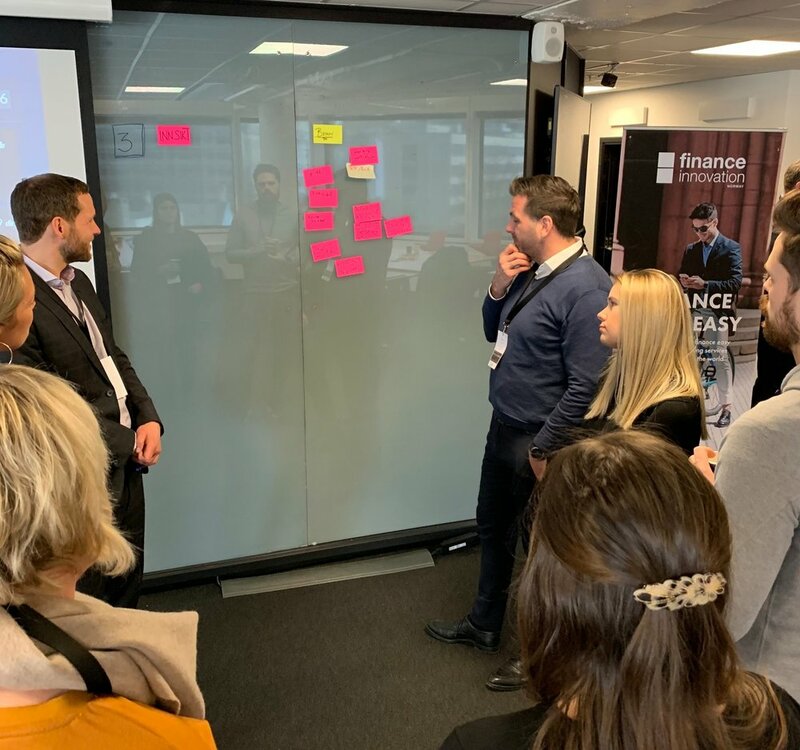 Following the presentations, members of NCE Finance Innovation came together for a workshop to discuss the presented cases and document the various needs and pain points experienced by the participating companies from the cluster. Two of the groups discussed how to make the customer control process easier, faster and better. There was a clear consensus among the participants that there is a desire for a common system for obtaining data about the customer. One of many good points was to get information from verified companies such as Finance Norway or the population register and use them in the onboarding process within the companies. Another group chose to discuss what kind of KYC/AML operations or sources they use that is separately from the main tool, which should be integrated into the core system. The participants realized that there are several internal and external sources they use daily, which are not integrated into the core system. Furthermore, the question was how to integrate these seamlessly into the system to ensure a better customer establishment. It was great to attend Think; Know Your Customer. KYC is a relevant topic and the workshop allowed participants from different industries to discuss the scope for a common approach with a view of simplifying solutions around KYC processes. Looking forward to the continuation! We aim to establish a working group on the Know Your Customer theme, to continue discussing and finding better solutions together. The cluster want to include our work related to KYC into an innovation platform. Here we will gather the knowledge and information we have and share this with our members. Think: KYC was hosted by: Vipps, BankID, BankAxept, Thommessen and NCE Finance Innovation. Think is a series of theme-based workshops suggested and hosted by member companies in the Fintech Cluster. Future topics can be discussed with Rea and Simen in NCE Finance Innovation.